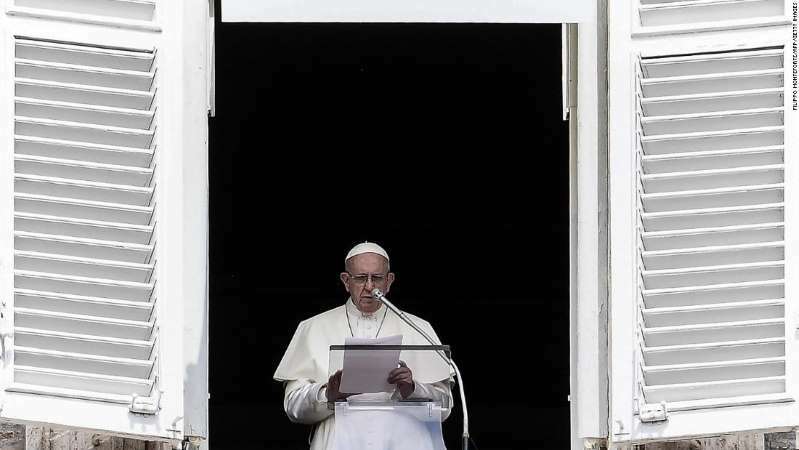 Pope Francis reads to pilgrims during The Angelus Prayer from the window of his studio overlooking St. Peter's Square, The Vatican on August 15, 2018, on The Feast of Assumption. Pope Francis arrives Saturday in Ireland on the first papal visit to the majority Roman Catholic nation in almost 40 years, where he will be greeted by fervent crowds and angry protests. His two-day visit comes as the Church is once again embroiled in scandal over clerical abuse, fueled by the release this month of a damning Pennsylvania grand jury report detailing decades of sexual abuse and coverups. Tens of thousands of people are expected to flock to Dublin's Croke Park stadium on Saturday, when Francis will deliver an address as part of the Festival of Families, a concert-type event. Organizers say hundreds of thousands more will attend a Mass celebrated by the Pope at the city's Phoenix Park on Sunday afternoon, with all 500,000 tickets for the free event booked out. [post_ads]However, the papal visit will also be marked by unprecedented protests over the Catholic Church's handling of the clerical abuse scandal. One, dubbed "Stand for Truth," will take place at the Garden of Remembrance in Dublin's Parnell Square at the same time as the Mass is celebrated. Some protesters also say they have booked tickets to the event in Phoenix Park but will deliberately not use them as a form of silent protest against the Catholic Church and its actions. Organizers of the "Say Nope to the Pope" protest said on Facebook they hoped to show solidarity to abuse victims and "show the Church they don't have the control they used to." Pope Francis-themed T-shirts and candles are seen on sale before the opening ceremony of the World Meeting of Families in Dublin. The Pope's trip coincides with the World Meeting of Families, a gathering of the Catholic Church held every three years that was thrown into chaos last week by the release of the Pennsylvania grand jury report. Amid rising international anger over the report's revelations, the Vatican confirmed this week that the Pope would meet privately with victims of clerical sexual abuse in Ireland during his visit to the country. It has not said where or when that meeting will take place. It is also "very possible" that the Pope will publicly address the topic of abuse during his visit, the Vatican's press office director, Greg Burke, told reporters. While in Ireland, the pontiff will also call on Prime Minister Leo Varadkar and President Michael Higgins, meet with representatives of the government and civil society at Dublin Castle and pay a private visit to a day center for homeless families run by Capuchin friars. On Monday, Francis acknowledged "with shame and repentance" the Catholic Church's failure to act over clerical abuse. In an unusually blunt letter, he wrote: "We showed no care for the little ones; we abandoned them." CNN's Eliza Mackintosh contributed to this report.